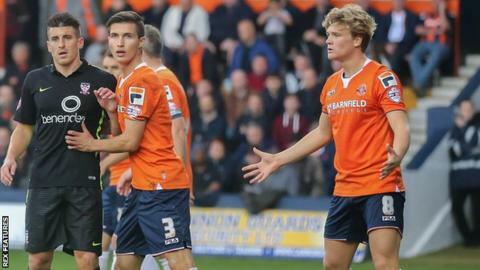 York City ended Luton Town's run of four consecutive league victories with a draw at Kenilworth Road. Keith Lowe gave York the lead late in the first half as he picked up John McCombe's pass and fired into the roof of the net. Luke Wilkinson came close to securing victory for Luton, but his header was tipped over by keeper Scott Flinders. "I'm totally frustrated and angry. To come away from Luton with a point and be frustrated shows you how well we played today. "We should have won. It was the tale of two penalties. Blatant penalty for me on Vadaine Oliver that wasn't given, and a soft penalty at the end where he couldn't wait to give it, for me. "Some of the decisions these referees make today put pressure on people's jobs but there was so many positives to take from today. "I'm so disappointed for the travelling fans because we should have been going home with three points." Match ends, Luton Town 1, York City 1. Second Half ends, Luton Town 1, York City 1. Cameron McGeehan (Luton Town) wins a free kick on the right wing. Attempt missed. Scott Cuthbert (Luton Town) right footed shot from outside the box misses to the right. Substitution, York City. Rhys Turner replaces Michael Coulson. Substitution, Luton Town. Nathan Doyle replaces Luke Guttridge. Attempt missed. Russell Penn (York City) left footed shot from outside the box misses to the left. Attempt missed. Scott Cuthbert (Luton Town) header from the centre of the box is close, but misses to the left following a corner. Corner, Luton Town. Conceded by Michael Collins. Attempt missed. Russell Penn (York City) right footed shot from outside the box is close, but misses to the right following a corner. Corner, York City. Conceded by Alex Lawless. Corner, Luton Town. Conceded by Scott Flinders. Attempt saved. Luke Wilkinson (Luton Town) header from a difficult angle on the right is saved in the top right corner. Corner, Luton Town. Conceded by John McCombe. Attempt blocked. Olly Lee (Luton Town) right footed shot from outside the box is blocked. Keith Lowe (York City) wins a free kick on the left wing. Goal! Luton Town 1, York City 1. Cameron McGeehan (Luton Town) converts the penalty with a right footed shot to the high centre of the goal. Penalty Luton Town. Dan Potts draws a foul in the penalty area. Penalty conceded by Keith Lowe (York City) after a foul in the penalty area. Corner, York City. Conceded by Steve McNulty. Anthony Straker (York City) wins a free kick on the right wing. Substitution, Luton Town. Alex Lawless replaces Jonathan Smith.